Only four marine reptiles exist in the world today, and they all have something in common: a means of ridding their bodies of excess salt taken in from their environment. If they did not have this ability, their body chemistry would become unbalanced and they would die. Each has a special gland that secretes salt, but no two have it in the same location. The saltwater crocodile is both the oldest and the largest reptile on the planet, and he doesn't live in saltwater all the time. He's born and grows up in fresh water, but moves to brackish water as an adult and goes to sea when he has to in order to find a new home with enough food. He's a tropical animal and inhabits the western Pacific and eastern Indian oceans. He gets around these huge stretches of water by riding the currents. He may weep "crocodile tears" from his eyes, but his salt glands are located on his tongue. The seven species of marine turtles are the next-oldest to the "salty," as Australians call the saltwater croc. They are true blue-water sailors, as only the females come ashore to lay their eggs; the males never set a flipper on land. Of the seven species, six are found in U.S. waters: the green, hawksbill, leatherback, loggerhead, Kemp's ridley and olive ridley. All sea turtles are endangered, at least partly because of destruction and plundering of their nests and nesting areas, getting caught in fishermen's nets and other debris, and being run over by boats, ships and other watercraft. Marine turtles get rid of their excess salt through glands near their eyes, so they're not crying because they're sad or in pain -- just too salty. Sea snakes might also be called sea serpents, but at a maximum of 6 1/2 feet long they're a long way from the ship-eating monsters drawn on old maps. They have a flattened, paddle-shaped tail for swimming power and are patterned with bands, stripes and spots according to which of the 50-plus species they belong to. They are venomous but not aggressive unless provoked, and most bites occur when fishermen try to get snakes caught accidentally out of their nets. The sea snake's salt-exuding glands lie under their tongues. 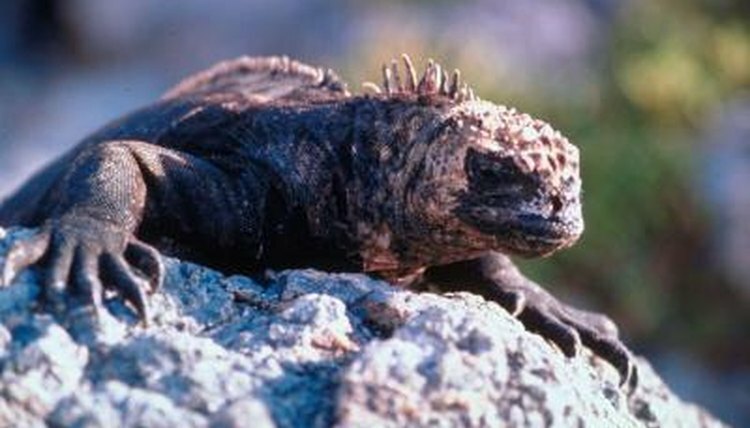 As the world's only sea-going lizard, the marine iguana has a very restricted habitat -- he lives only on the Galapagos Islands off the west coast of South America. He is the youngest of the marine reptiles, having branched off from his land-living cousins only some 10 thousand years ago. He feeds exclusively in the water, grazing on algae growing on the rocks underwater, and has long claws to hold on to the rocks while he nibbles. He comes out of the cold water around the islands to warm up in the sun and to snort salt. He may look like a menacing dragon, but that's not smoke coming out of his nose -- glands inside the nostrils filter excess salt from his bloodstream, and the iguana literally sneezes it out.